I'm pretty psyched. I finished my Christmas Eve Cast On Easy Ragland sweater last week. I still haven't had a chance to block it. It's looking a little wrinkly and the colorwork stitches will be much improved after a good blocking. I'm sort of dragging my feet on it now though because the polar vortex has gone away and left us with Glorious 60 degree days. There's just no incentive at the moment. The yarn is Knit Picks' Wool of the Andes Mineral Heather (main color) and Blossom Heather (contrasting color) and the pattern is Easy Ragland from Green Mountain Spinnery. I made a few pattern adjustments. First, I did my own version of a mock cable instead of the suggested ribbing. I lengthened the body several inches (I'm tall!) and I added the colorwork. I wish I'd put a little more thought into the colorwork. It was one of those 4:00 a.m. decisions. You know the kind.... I've already knit a few inches of purple stockinette, I'm bored and I have a million, jillion more miles of purple stockinette in front of me.... Let's throw in some color. The color design worked out okay but there are a few things that bug me about it. First, it's squared off instead of rounded like most sweater yokes. 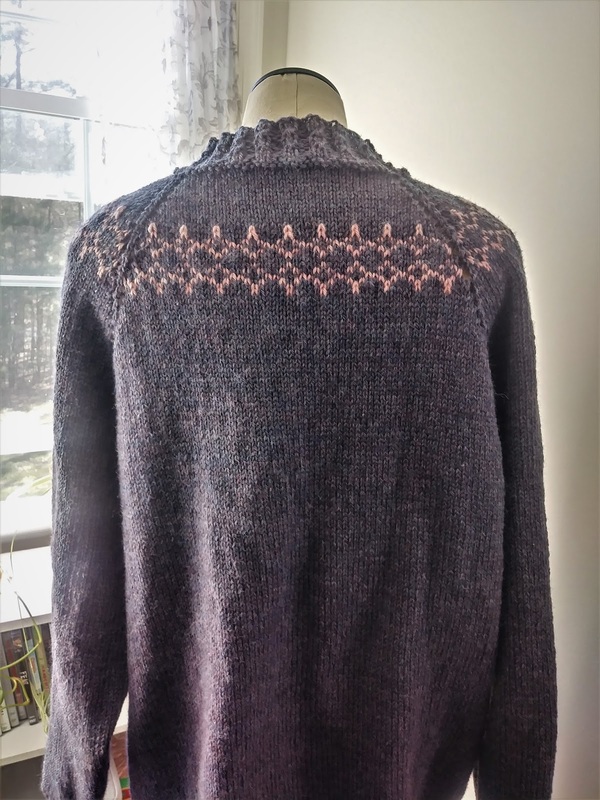 The sweater pattern's ragland shaping calls for yarn over increases which caused the squaredness. It also caused some of the stitches on the increase line to look a little funky. Hopefully blocking will help that. Otherwise, I'm pleased with this sweater. It fits perfectly. Oh, that's another modification I made - I did the sleeve decreases every 3/4 inch instead of every inch. 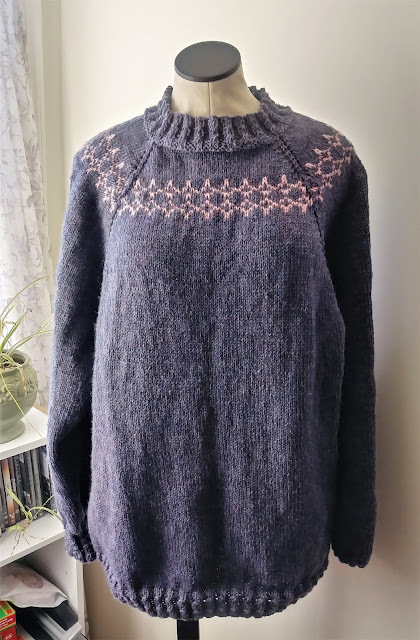 I've knit this sweater many times before and the sleeves always end up being too big and puffy just above the wrist cuffs. 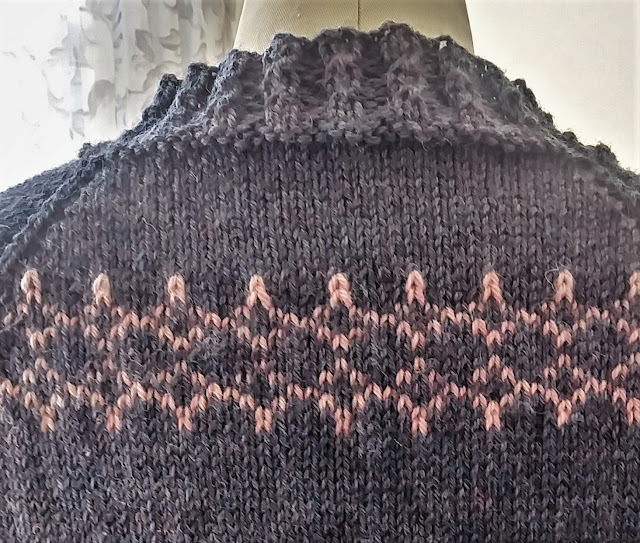 If you're interested, the colorwork design is Beacon from Alterknit Stitch Dictionary. As I mentioned, the polar vortex is gone. We are now experiencing 60+ degree days. 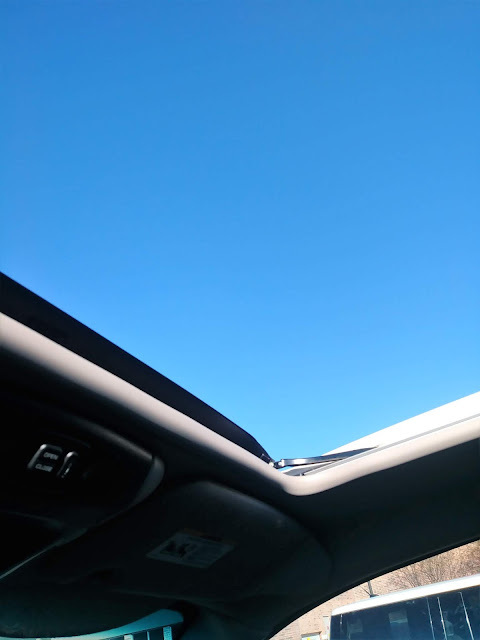 I ran errands all day yesterday with the sun roof wide open. There is just nothing better than the sun shining on your face through an open sun roof after multiple zero degree days. Look at that blue sky!!! We had really mild weather the past couple of days, but temps are dropping again. I really like your sweater, and I think the color work looks great. Also love the colors you chose for this. I love a good raglan. You can't get more comfy than that. This weather is something. The Mister is freaking out about yard work and I keep reminding him it's only FEBRUARY. There's still plenty of time before the heat hits us. Yay for finishing cozy sweaters!! Except when it's 60 degrees outside. So, do you want it to get cold again so you can wear it? Or no? beautiful!! I love the colors and the raglan sleeve, it's one of my favorites to knit and wear. Great job!! !